Day two of the NCAA Championships is underway at Hayward with continued competition in the decathlon and the start of the Women’s heptathlon. Check back throughout the day for updates from all the events and to find out how Oregon athletes are faring. Dakotah Keys in the decathlon final, Greg Skipper in the hammer final, English Gardner in the 200 meter semifinal, Anne Kesselring in the Women’s 1,500 meter semifinal, Jonathan Cabral in the 110 meter hurdle semifinal, Megan Patrignelli in the women’s steeplechase semifinal and Matthew Melacon and Parker Stinson in the Men’s 10,000 meter final. In an interesting duel between the brawny Johannes Hock from Texas and the lithe Jeremy Taiwo from Washington, Hock managed to muscle his way to championship in the Men’s decathlon. Taiwo was posting top marks in the jumping events but Hock dominated the throws and did enough in the rest of the events to win the title with a total of 8,263 points. Taiwo finished with 8,239 points. Oregon Sophomore, Dakotah Keys, finished in 11th place with 7817 points. The Oregon Men’s sprinters were on-point this afternoon. In the Men’s 110 meter hurdles Oregon Sophomore, Jonathon Cabral, advanced to the finals on Saturday by winning the second qualifying heat of the day with a 13.46. In the Men’s 4×100 meter relay the Oregon Men posted the fastest time in the preliminary heats. The Pac-12 champions will run for the championship on Saturday. Lawi Lalang of Arizona won the Men’s 10,000 meters with a 29:29.65. Oregon distance runner, Parker Stinson, finished sixth with a time of 29:46.45. LSU jumps expert, Damar Forbes, won the long jump with a leap of 27′ 4 3/4″. The points were valuable for LSU as the SEC school hopes to make a run for the team title. 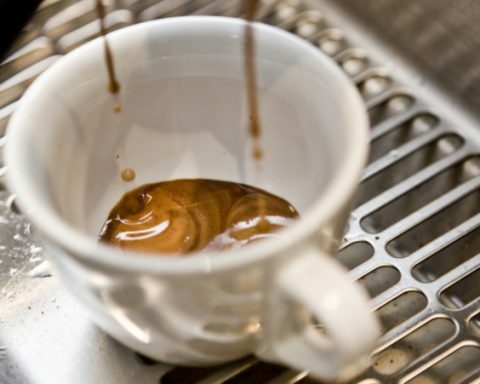 Check back tomorrow for the first large batch of finals results and more in-depth analysis! The Oregon Men and Women made a strong showing in the 1,500 meter semifinals. On the Women’s side both Becca Friday and Anne Kesselring automatically qualified for the final on Saturday by finishing in the top five of their respective heats. For the Men, Mac Fleet advanced to the final on Saturday after winning his heat. In the Women’s discus the entire state of Arizona was in the spotlight with Arizona State Jr. Anna Jelmini taking down the event with a throw of 190′ 1″. In the runner-up slot was Arizona athlete Julie Labonte with a throw of 184′ 6″. The Men’s hammer finished with Virginia Tech thrower Tomas Kruzliak emerging as the victor with a best of 227′ 3″. Just behind Kruzliak, from USC, was Remy Conaster with a best on the day of 224′ 1″. 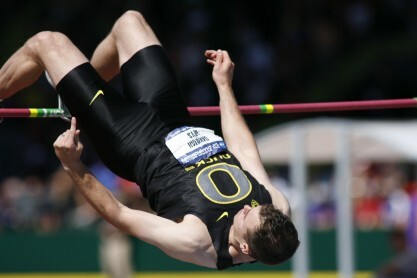 Oregon Freshman Greg Skipper finished in fourth with a throw of 219′ 11″. A few notes on early action at Hayward. Oregon Track and Field legacy, Greg Skipper, posted the second best throw in the qualifying rounds in the Men’s hammer throw, with a 219′ 11″. He is chasing Tomas Kruzliak of Virginia Tech who threw a 227′ 3″ in qualifying. He will compete in the finals after the top nine competitors from qualifying finish their warm-up period. 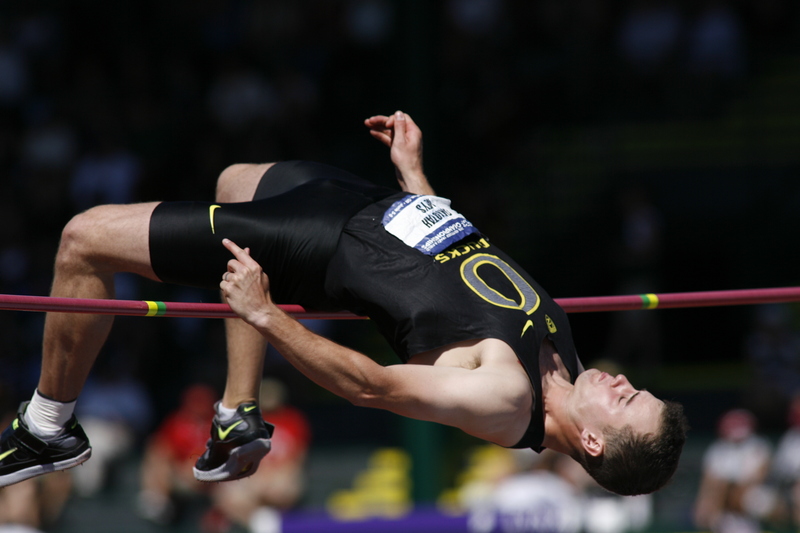 Dakotah Keys, the Oregon Decathlete, is sitting in 17th place after seven events. He should move up the standings after a strong showing in the vault where he cleared 16′ 3/4″. After the vault two events remain, javelin and the 1,500 meters.